A new study suggests that those who follow healthy dietary patterns that prominently feature fruit, vegetables, nuts and legumes may be at a reduced risk of depression. The study, published in BMC Medicine, found that adherence to the Mediterranean diet, the Pro-vegetarian Dietary Pattern or Alternative Eating Index-2010 appeared to play a protective role against the illness. "We wanted to understand what role nutrition plays in mental health, as we believe certain dietary patterns could protect our minds," explains lead researcher Almudena Sánchez-Villegas, of the University of Las Palmas de Gran Canaria in Spain. "These diets are all associated with physical health benefits and now we find that they could have a positive effect on our mental health." While much research has been carried out assessing the role of diet in the prevention of noncommunicable diseases such as cardiovascular disease and cancer, far less attention has been paid to the influence of diet on the development of mental disorders. For the study, the researchers chose to compare three dietary patterns that had previously been found to have inverse associations with mortality from different diseases, including cardiovascular disease and cancer. A total of 15,093 participants from the SUN (Seguimiento Universidad de Navarra) Project were assessed. The SUN Project is a cohort study that began in 1999 which has previously been used by researchers to identify dietary and lifestyle factors that alter the likelihood of different medical conditions. Each participant was free of depression at the start of the study. The researchers assessed the participants' dietary intake with food frequency questionnaires completed at the beginning of the study and then again after 10 years. Adherence to a selected diet was determined using a scoring system. Food items such as meat products and sweets tended to be negatively scored, while food items such as nuts, legumes, fruits and vegetables were positively weighted. After the follow-up period, 1,550 of the participants reported either having received a clinical diagnosis of depression or having used antidepressant drugs. Of the three diets, adherence to the Alternative Healthy Eating Index-2010 was associated with the greatest reduction in depression risk. 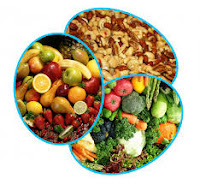 This diet is characterized by high consumption of vegetables, fruits, whole-grain bread, nuts, legumes, long-chain omega-3 and polyunsaturated fatty acids intake. However, better adherence to all three diets compared in the study was associated with a reduced risk of depression, leading the researchers to conclude that this reduced risk may be due to common ground shared by the diets in the form of high levels of certain nutrients. "The protective role is ascribed to their nutritional properties, where nuts, legumes, fruits and vegetables (sources of omega-3 fatty acids, vitamins and minerals) could reduce the risk of depression," concludes Sánchez-Villegas. "So, once the threshold is achieved, the reduced risk plateaus even if participants were stricter with their diets and eating more healthily," she adds. As a result, this finding suggests that a low intake of certain nutrients could represent a risk factor for future depression. As this study is reliant on self-reporting from its participants and only measured dietary adherence at two points in time, the researchers state that more research is needed to explore this possible dose-response pattern.